Peter Thiel, a PayPal founder and an early Facebook investor, is one of the most talked-about and revered internet business pioneers. And a billionaire. His views on how to build a successful startup are required reading for entrepreneurs in Silicon Valley. and they can also help you come up with radical, new marketing strategies. Read on. Peter Thiel co-founded Paypal in the 90s and was also an early investor in Facebook, Palantier, Yelp, and Quora among many other well-known startups. His ideas on how to build and market new companies are regarded as visionary and the success of his investments is often attributed to his guidance. When you're starting with a blank slate, it's often tempting to just do something similar to what you've done before. And it seems less risky, as what worked before is likely to work again. But by never pushing the envelope, you will never know if your campaigns could perform better. You may be leaving clicks - and conversions - on the table. And, in that light, doing the same thing over and over again is then the risky option! 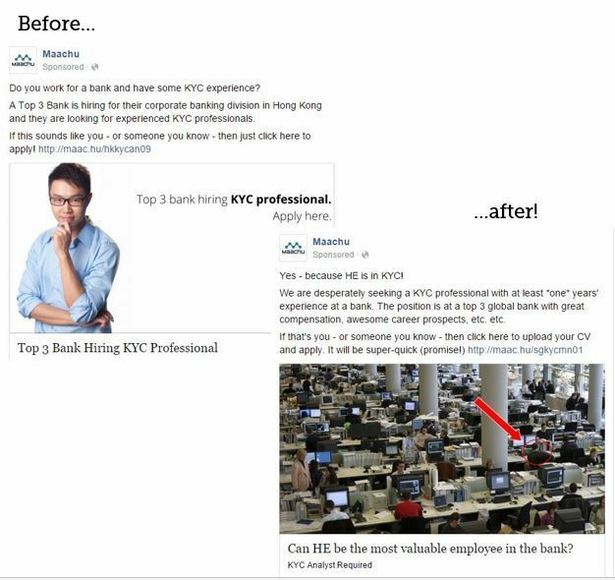 I was trying to advertise a relatively standard banking role and so I initially picked a corporate looking fellow with the job title in the role. The ad worked OK, but then I noticed that the News Feed has a lot of 'linkbait' photos these days, and they really grab attention. It definitely works on me, I thought, so why not give it a go for my ads? The results were outstanding. From .2% CTR to 2% - a 10x improvement! Now I'm not trying to say that this result is typical, or that this is exactly what you should try. But by being bold instead of conventional, I was able to find a strategy which had the potential to outperform. What you should try: Test something as 'out there' as you can get away with. At the very least you will learn something.